10th Planet was one of the first facilities to offer video enhanced CD and VCD authoring, pre dating the availability of DVD by several years. 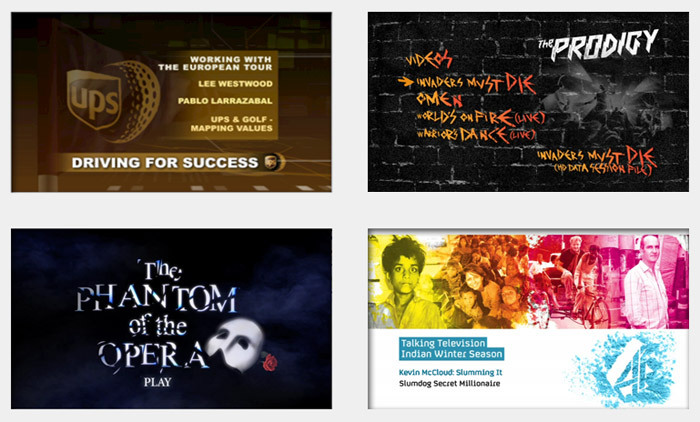 We have built on that experience to offer an award-winning DVD authoring service. 3D motion menus, multi language audio with subtitle options and hybrid DVD ROM/Video discs are all efficiently tackled by our highly experienced authoring team. We use scripting and DVD abstraction layer editors to really squeeze every last bit of functionality out of this format. Although digital delivery has reduced the consumption of consumer DVD, it is still one of the most cost effective delivery methods for promotional films and corporate information. Click below to view our motion menu reel. With in house design for both menus and packaging and a skilled motion graphics department, we create a cohesive identity for your DVD releases, both for retail and promotional use. Our experience in multi region and multi language authoring means that we can manage the entire DVD Mastering process for you, including all translation and international version requirements. Of course we can also work with your design and branding department, providing you with the technical backup of our DVD encoding and DVD building team, to ensure a fully DVD book compliant DVD master – meaning no nasty surprises in your DVD production. In these budget concious days there is often the need to reduce costs and the temptation to bring authoring in house may be great, it is something that can be more expensive in the long run. Consumer and pro-sumer authoring applications may be great for creating simple DVD for duplication projects but if you plan on creating a master for replication, then professional authoring and mastering is a must. DVD replication masters are ideally supplied as DDP images (though DVDR are accepted). It is possible to have a DVDR that plays perfectly on a standalone DVD player but that still fails the checks that are carried out as part of the replication process. To ensure that your project is not delayed by mastering problems it is advisable to ensure that you use a professional authoring facility. If you are supplying assets for us to build a DVD then please follow our guidelines at the DVD Asset Guide section. Hybrid DVD Video/ROM allows us to create DVD projects with the immediacy of DVD video but backed up by extensive supporting resources such as PDF documents and high resolution images. We have successfully completed a number of hybrid ROM/video projects for a variety of clients, both corporate and entertainment, including major international campaigns for brands such as Disney, Transport for London and Diageo. Blu-ray authoring has been a recent addition to the list of authoring services we offer and in a short space of time has proved popular in store and promotional use. No other format comes close in terms of picture quality.